THE USE of the name as a divinatory instrument is the use to which it is put in the various systems of numerology. And because divination may be approached from so many angles and yet give good results it does not follow that any of the different systems of numerology in use are valueless. The method we have found to give the best results is set forth in the next Chapter (Serial Lesson 28). But the use of the name as a vibratory influence that affects the individual wearing it in a particular way is not related to divination. Nor can there be more than one interpretation which is correct, of the vibratory force exerted by a particular name as affecting a given individual. The vibration of a name, or of a number, is a positive thought-force of a definite quality; as much so as that light-vibrations of a certain frequency give rise to the color blue. You can not correctly call blue red, yellow, green or some other color. Such is the difference between the system I am now explaining and numerology. A name has a definite thought-vibration quality which is radiated to the individual by everyone who thinks of him by that name. If different people think of him by different names, they thus bombard him with different types of thought-vibration. But because an individual usually thinks of himself by the name he customarily uses as his signature, and because the thought-vibrations of the person wearing the name probably have more influence upon him than the combined thought-vibration of all others who think about him, the way an individual signs his name becomes very important as a vibratory influence in his life. If such a signature were something unalterable this would be an interesting but not very useful fact. But as a matter of observation, it is quite common for people in all walks of life to use a different signature at different periods in the life: using an initial instead of a given name, dropping the use of a middle name or initial, or even changing the spelling of the name. A woman when she marries, and therefore coincident with a marked change in her fortune, commonly changes her name. Others, also, who change the spelling of their name, or alter the signature, are discerned to change in fortune coincidentally. A change in name is nearly always accompanied by a change in the life. Writers quite commonly use a pen name, and actors, more frequently than not, use a stage or screen name. And these names by which they are known to the public not only influences them according to the key of the name, but also from a divinatory standpoint often markedly differentiates their public life from the private life in which they are known by another name. The practical application of the knowledge of thought vibrations, character vibrations and astrological vibrations is in selecting those invisible influences which assist to bring into the life the things which are desired, and which prevent attracting events and conditions which are undesirable. Yet one can not know, by a positive method, what types of astral vibrations will prove beneficial and what types detrimental, and in what way this benefit or detriment will manifest, without a map of the astral body, such as is furnished by the astrological birth-chart. But with the astrological birth-chart at hand, it can at once be seen just what the effect will be upon the life of stimulating into unusual activity any particular section of the astral body, or any particular center of energy in the astral body. Even the connecting aerials, or aspects, between such centers of energy are there clearly shown, so that the effect upon other departments of life through secondary influences can also be determined in advance. A scrutiny of an astrological birth-chart will reveal to anyone who has even a slight acquaintance with astrology just what zone of the astral body, or what thought structure, it is advisable to give added force. If the individual wishes to attract favorable conditions in some special line, a glance at the birth-chart will reveal what influence there shown most pronouncedly is beneficial to it. Then by stimulating this influence, by using a name having the same key-tone, and by having things in the environment which radiate the same key-tone, the activities of this favorable influence can be built up in a manner that will markedly attract the condition desired into the life. The changing of the name, it will thus be seen, if the change causes the name to vibrate to a different key, adds the thought-energy of all those who think of this name in connection with the individual, to some different section or center in the astral body, and this causes a change in the fortune commensurate to the transfer of energy thus effected. Unless the individual wishes especially to stimulate some one thing in his life in a favorable manner, the best plan in selecting a name or the objects and people of the environment, is first to find what influences in the birth-chart are more fortunate. This can be determined in a general way by inspecting the house positions and aspects of the planets. But by calculating the harmodynes and discordynes of the chart the relative harmony and discord of each planet and sign can be precisely determined. It may be desirable to give the added intensity to a section of the astral body not occupied by a planet because the department of life it rules may be deemed more important. When this is the case, the favor or disfavor that may be expected from such stimulation is determined by the harmony of the planet ruling the sign governing the zone thus selected. The common thought-cells of the astral body are mapped by the signs, and the dynamic thought-cells by the planets. The power and harmony or discord of an unoccupied sign is one-half that of the planet ruling the sign. In seeking the influence that will conduce most to the general good fortune the best planet and the best sign in the chart should be located. Then, if possible, the name should be spelled, abbreviated, or otherwise altered, so as to have the same key as the best planet or best zodiacal sign. If a sign is occupied by a planet, or planets, accentuating the sign also accentuates the planet, or planets, in the sign. As a planet has twice as much influence as the unoccupied sign it rules, the harmony or discord of a planet, or planets, in a sign may be more important than the harmony or discord of the planet ruling the sign elsewhere located. Thus in selecting the best zodiacal sign, the harmony or discord of any planet, or planets, in it must be given due consideration. Usually without much alteration a name may be given such spelling or abbreviation as to cause it to vibrate to the key which has been selected as most desirable. A long name, however, can not vibrate to Key 1, and thus accentuate the influence of Mercury in the astral body; for to get this key the number of the name must be either 1 or 100. A name vibrating either to the number 99 or the number 198 gives key 18; but to get key 19 the number of the name must be either 19, which is low, or not less than 199, which is quite high for the ordinary run of names. Yet when it is desired to get a special type of vibratory key in the name—for there is no number above 21 which gives key 21 until 399 is reached, and thus it is impractical to accentuate the Sun thought-cells in the astral body through using key 21—often almost the same result may be had by accentuating the sign the Sun occupies in the birth-chart. Thus if the Sun were the only planet in Virgo, the number 101—1 plus 0 plus 1 gives 2 (Virgo)—would accentuate key 2, and because the Sun thought-cells are in Virgo, it would be the influence chiefly accentuated. Of course, Mercury, as the ruler of Virgo, would be somewhat stimulated, wherever located; but the most pronounced influence would be the energy thus added to the Sun structure. To illustrate by a personal example: When the author was selected to write the various lessons and other publications issued by The Brotherhood of Light, he felt it advisable to use a distinct name for these publications that would indicate that whatever appeared under this name had the sanction of The Brotherhood of Light, and was, therefore, in this respect authoritative. In addition to his occult interests he is also a naturalist, writing and lecturing on natural history subjects. He also has, as does everyone, a private life. And while it is unlikely that any of his private opinions would differ from those of The Brotherhood of Light, he did not wish to carry the responsibility of having any chance utterance he might make in an unguarded moment quoted as a Brotherhood of Light doctrine. So he decided he would select a pen name, that whatever appeared under that name should have the weight and careful thought of a Brotherhood of Light teaching; and that he would retain the name Elbert Benjamine for business purposes and for such writings as he did on other than occult subjects. Now as he had entered into an agreement with The Brotherhood of Light to write a series of courses of lessons, each of the 21 occult sciences to be treated in a separate course, and ultimately to be published as a separate book, he felt that the chief requisite of the name should be to stimulate the tendency and ability to study and write about occult subjects. The announcement of the titles of these 21 courses to be written was made in the Declaration of Principles published early in May, 1915. In his birth-chart the author has the sign Aquarius on the cusp of the third house, the house of writing. Its ruler, Uranus, is the most elevated planet in the chart. The aspects it receives are not all beneficial; but some of them are strongly harmonious, and those that are not, tend to attract just such discords as any person must attract who ventures to write and publish ideas that are as yet unaccepted by the vast majority of the race. So to give an impetus both to writing and to the acquisition of occult knowledge (for Uranus as ruler of Aquarius governs occultism) he decided that the chief thing to add energy to was the zone of his astral body ruled by Aquarius. The name, therefore, must vibrate to key 9. Because the ability to gain information from the inner planes is chiefly ruled by the planet Neptune, and because it is the best planet in his birth-chart, it was thought advisable also to accentuate key 11. This could be done, although only in a minor degree, by using the initial C.
There were other considerations also of a symbolic nature. Zain (or Z) is the seventh letter of the Egyptian alphabet, and not only means victory, but corresponds to the sign Sagittarius, which is the natural ruler of the house of religion. And the writing and work to be accomplished was of a religious character; the re-establishment of The Religion of The Stars. Z also is a very peculiar letter, representing two 7’s, one above and one below. Also 7 is an open trine, indicating giving out rather than receiving; and it was the author’s purpose in issuing The Brotherhood of Light lessons to give as wide dissemination, both to material facts and to spiritual doctrines, as possible. Furthermore, the author is a double Sagittarian; that is, he has Sagittarius both for a rising sign and for a Sun sign. So that not only were the vibratory ends sought gained by the use of C. C. Zain as a pen name—C-11, C-11, Z-7, A-1, I-10, N–14: 11 plus 11 plus 7 plus 1 plus 10 plus 14 gives 54; 5 plus 4 gives key 9 adding energy to the section of the astral body ruled by Aquarius—but it is an accurate translation of the strongest influences in his birth-chart into letters combined in a name. Whoever, therefore can read this name aright, can know the source from which these writings come, the motives prompting their expression, the method by which the information they contain was gained, and much about the inner life of the author. The name in full, given as a tarot chart is—IX—XI—XI—VII—I—X—XIV—VI. This may be read as Wisdom (9), and early Spiritual Power (11), followed by Psychic Strength (11), leading to Victory (7) over obstacles. Will and Intelligence (1), after a time dictate a Change of Fortune (10) and this brings Regeneration (14) and still other Trials (6). At first thought it may seem that using a name in business other than that conferred at birth is exceptional other than in a few professions. But a little reflection will indicate that most people in business abbreviate, or otherwise alter the name, in using it as a signature. And because people become familiar with this signature, it becomes more strongly associated in their minds with the person using it than any other name. The person signing himself in a given way, because he writes his name thus, and both makes and sees the signature, comes to think of himself according to the signature as written. And the name by which an individual thinks of himself, because his own thoughts are more powerful to influence his life than the thoughts of others, is commonly the most important name of all. Therefore, because the business signature determines the thought-vibrations sent him by those who see this signature, and the thought-vibrations which he generates when he thinks of himself by name, it should be selected with an end in view of stimulating some department of life as desired, in a favorable manner. This is done by selecting for a business signature a name the vibratory key of which corresponds to the sign or planet in the birth-chart most favorable to the department of life it is wished to strengthen. Arcanum IX. Letter: Egyptian, Thela; Hebrew, Teth; English, Th. Number, 9. Astrologically, the zodiacal sign Aquarius. Color, the lighter shades of blue. Tone, high G. Occult science, mental alchemy. Human function, clairaudience. Natural remedy, such herbs as myrrh, frankincense and spikenard. Mineral, the talismanic gem, sky-blue sapphire, and such stones as obsidian and black pearl. Th—9, expresses in the spiritual world, absolute wisdom. Remember, then, son of earth, prudence is the armor of the wise. Circumspection enables one to avoid snares and abysses and to foresee treason. Take it for thy guide in all thy actions, even in the least. Nothing is indifferent here below. A pebble can overturn the chariot of the master of the world. If Arcanum IX should appear in the prophetic signs of thy horoscope, keep in mind that speech is silver and silence is gold. Number. —Nine is the Deific number, the highest digit, which possesses the unique property that it may be multiplied by any number and the digits so obtained when added together always resolve into 9. 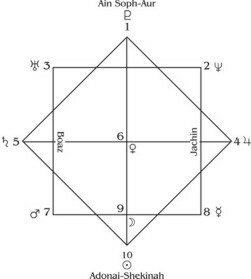 On the inner-plane, where thought-vibrations and astral-vibrations of all kinds become effective, 9 is the perfect scale, even as 7 is the perfect scale of physical form. Such vibratory rates, consequently, are measured by decaves instead of by octaves. As the multiples of 9 resolve, when their digits are added, into 9, it is the symbol of manifested Deity whose different manifestations may all be reduced to the one primal source. It is the figure unlocking the cycles of the ancients, and as composed of 3 times 3 indicates action on all three planes. As composed of 4 plus 5 it represents man realizing all earth can teach, and thus is the number of wisdom. As consisting of 7 and 2 it adds polarity, intuition and wisdom, to the union of man and woman, giving knowledge of good and evil, or wisdom gained through union. As 8 and 1 it is death, mortality and stagnation overcome by will and intelligence; hence new action, life, immortality. Astrology. —The zodiacal sign of the Sun, Leo, is represented by the symbol of a serpent. This serpent, natural ruler of the fifth house of a birth-chart, and thus of pleasures and love-affairs, is the symbol of desire. This is a clear statement of the import of Arcanum IX. The love nature is signified by doves, which are sacred to Venus; and the power of Aquarius to properly direct the love nature is indicated by the reference to wisdom. Aquarius astrologically represents the highest form of intelligence, expressing progressively in scientific and occult interests, such as are depicted in the arcanum of the Sage. Human Function. —The highest wisdom, such as symbolized by the Sage, comes both from within and from without. Experience with good and evil is garnered in the external world and stored together with the experiences garnered in the interior realms. The two sources of knowledge are thus symbolized by the two wavy lines, anciently also depicted as two serpents. The Sage thus not only has listened to the teachers in the external world, but he has also been guided by those speaking from the inner plane; and to hear them he has developed the faculty of clairaudience, which thus corresponds to Arcanum IX. Alchemy. —In alchemical processes of any kind, danger is sure to be present if the conditions are forced. Transmutations, for instance, can not be made to take place instantly. They require time. To try to alter a condition too quickly is apt to result in an explosion. Whatever energies are present must be taken care of through gradually diverting them into those channels which will promote the object sought. More failure in alchemical work results from undue haste and impatience for results than from any other cause. The prudence which alone enables the alchemist to be successful in his endeavors is depicted by Arcanum IX. Bible. —In the Bible we find that the tempting serpent of desire denied the word of God that man would die when he should eat of the forbidden fruit. “For God doth know that in the day ye eat thereof, then your eyes shall be opened; and ye shall be as gods, knowing good and evil.” (Gen. 3:4). That is, after partaking of the Tree of Good and Evil they gained knowledge and immediately put forth an effort to overcome matter and Triumph over circumstances, as indicated by Arcanum VII. Still another reference to Arcanum IX is Solomon’s choice of Wisdom instead of worldly goods. Masonry. —The Select Master degree of Masonry is founded upon Arcanum IX. It signifies the ninth arch of the secret vault of Solomon’s Temple, where are stored exact copies of all that is contained in the sanctum sanctorum above. It is what might be called the lowest degree of adeptship on the physical plane, being the Intellectual degree in which man has recognized the correspondence between the heaven above and his soul. Arcanum IX corresponds also to the three triangular tables arranged in a row with a triangular plate of gold in the center of each and a lighted candle at each corner. It corresponds likewise to the three times three of the ritual. Magic. —In Magic, Arcanum IX corresponds to the various magical methods of obtaining information about occult subjects. In such endeavors there are two chief methods which are followed. One is to leave the physical body and travel in the astral form. Through this process it is possible to visit the homes of the dead, to sit at the feet of the wise in the Halls of Learning on the astral plane, and to gather information through personal contact and observation, while the physical body slumbers on earth. The other method, which is beset with far fewer dangers, is to tune in on the plane from which it is thus desired to gain information. In this tuning in process the proper astrological conditions are usually observed, and often it is assisted by an appropriate ceremony. Initiation. —In the soul’s pilgrimage, Arcanum IX indicates the attainment of cosmic consciousness. Upon arriving at this state of his upward ascent the neophyte is able to discern the proper relations of the various entities in the universe, both to himself, and to each other. This is not merely an intellectual conception, but is borne home to him also through tuning in on the universal organism. He recognizes that each soul is being trained to perform a work which the expansion of the cosmic organization makes needful. As a result of this higher state of consciousness he comes to recognize quite clearly the nature of his own function in universal work, and thus sets about his task with the knowledge that he is a valuable factor in the scheme of things, with a certain and definite mission to perform. And upon his faithfulness in performing what he comes to recognize as his present task in contributing to cosmic welfare, depends his future opportunities for progression. Quite important in arriving at this higher state of consciousness, wherein he perceives his cosmic work, is the development of his affectional relations. That is, the power to tune in on either higher or lower states is chiefly regulated by the emotions. Passion and gross expression, therefore, must be supplanted by more exalted expressions of love. That which is gross and degrading tends to tune the mind in on lower states. But acts which engender strong emotions of tenderness, and kindly feelings that are so expansive as to embrace all, and which uplift the energies in intense desire for noble work, are the most effective agents known to tune the individual in on higher realms and to develop cosmic consciousness. Cosmic elementals—sylphs, salamanders, undines and gnomes—as well as magnetic elementals such as fauns, elves, nymphs and fairies, have relation to man; but they are not dependent upon him for intellectual and spiritual force, as are the so-called degrees of life. Yet his thoughts and desires do arouse them into activity, and may enlist them in the performance of such work as is within their special province. His proper relation to all such life-forms, and the work he should do aiding cosmic progression, are revealed to him when he attains cosmic consciousness. Occult Science. —Mental alchemy treats of the mental factors and how they may be made most effective to attract into the life just the conditions required. The process consists largely in transmuting discord into harmony and in providing the proper flux to annul undesirable conditions. Under Arcanum V we found that four signs express the absolute and are in turn explained by a fifth. And now, rather paradoxically, we find that 9 symbolizes the absolute in expression. But if we use the lamp of the Sage to look beneath the surface of this apparent contradiction, we find that 5, or intelligent man must have a medium through which to express; a place in which to move and work, as signified by the square mantle of the Sage. This universal medium, of course, is symbolized by the number 4. Thus Arcanum IX sheds much light upon how mantrams, suggestions and the processes of mental-alchemy bring about their results. For those with a penchant for symbolism to add further light upon their researches, this whole subject will be given clarity through a study of the diagram, page . The square marked 1 should be colored yellow; 3 should be colored green; 5 should be colored purple; 7 should be colored red, and 9 should be colored violet. These are the five odd, or active, numbers. The colors yellow and red signify power (love) and motion (life). However, activity must take place in a medium, which is represented by the four squares marked with even numbers, which should be colored the other primary, blue. Then the squares 5 and 3 represent the reaction of yellow and red on blue, and as stated are purple and green. And the central square, representing the highest vibration, the evolution of all below, should be colored violet. Finally, the border around the whole figure, the solar combination of power and activity, should be colored orange. The sign Aquarius is general significator of friends, associates, hopes and wishes; therefore the nines in their more common divinatory significance must relate to one of these things, according to the particular department of life signified by the suit. But in their higher application they reveal the influence of, and can be interpreted by, the ninth decanate of each zodiacal triplicity, starting the count from the movable signs. The divinatory significance of the Nine of Scepters is a wise and profitable friendship; its inner interpretation is ILLUMINATION. The divinatory significance of the Nine of Cups is that the hopes will be realized; it is the WISH-CARD; its inner interpretation is VICISSITUDES. The divinatory significance of the Nine of Coins is money spent on associates; its inner interpretation is REASON. The divinatory significance of the Nine of Swords is a quarrel resulting in enmity; its inner interpretation is RENUNCIATION. Arcanum X. Letter: Egyptian, Ioothi; Hebrew, Jod; English, I—J—Y. Number, 10. Astrologically, the planet Uranus. Color, dazzling white, like snow in the sunshine. Tone, the astral chimes. Occult science, natal astrology. Human function, intuition. Natural remedy, electricity and mesmerism. Mineral, uranium. I—10, expresses in the spiritual world, the active principle which vivifies all being. Remember, then, son of earth, that for power thou must will, that is, will strongly; thou must dare, and to dare with success thou shouldst know how to be silent until the moment of action. If the Wheel should appear in the prophetic signs of thy horoscope, know that to possess the Key of Power you must learn to will persistently only for what is good and true. And in order to maintain thyself upon the heights of life, shouldst thou reach them, thou must have learned how to sound with a look, and without dizziness, the vastest depths. This is the wheel of destiny. The circular platform upon which the sphinx stands represents the zodiac; and the sphinx, as a composite of the four constellations marking the zodiacal quadrants—Eagle, Lion, Man and Bull—signifies the passage of time. Number. —The number 10 represents the completed cycle, and therefore the starting point of another. It thus indicates transition to a new phase, or plane, of existence. The absolute having expressed itself through all the various manifestations up to and including 9, which signifies perfection of consciousness in addition to perfection of form, commences a new gamut. 1 is the absolute unmanifest, and 9 is the perfection of its manifestation. In humanity, as composed of two 5s, 10 indicates the whole man to consist of both man and woman, and that their union commences a new and higher phase of existence; that is, that it enables them to contact a higher plane of endeavor. 1 symbolizes will and intelligence, and 10 shows that they are now used by both in a new and higher field of endeavor. Astrology. —Uranus is the octave expression of Mercury, even as Arcanum X is the second decave of Arcanum I, ruled by Mercury. The unsexed quality of Uranus is depicted in Arcanum X by the two serpents in equilibrium. Uranus transits one sign of the zodiac in about 7 years, and the whole zodiac, completing the circle through the 12 houses of a horoscope, in about 84 years. That is, it corresponds to perfection of form in each department of life, its complete cycle coinciding with the present natural life of man. More than any other planet it gives sudden changes of fortune, either for good or for evil, and sudden change of the mental viewpoint. Human Function. —In natal astrology it is found that those individuals who have Uranus prominent in their birth-charts have the ability to short-cut their reasoning. Instead of the ordinary slow mental process of the objective mind, the processes are carried out by the unconscious mind which has more complete data at its disposal, and which acts almost instantly in drawing conclusions from them. These conclusions thus arrived at then rise into the objective consciousness as intuition. Alchemy. —No matter what the plane of alchemical procedure, it is a decided aid to observe the astrological conditions which are operative at the time. The energies of the planets have an influence upon all processes, and it is easier to perform a given type of work when the astrological influences favor it. Of course, alchemical work of many kinds can not await favorable conditions. But the knowledge that astrological influences are hindering at certain times, both incites to more careful and energetic effort and prevents discouragement when it is observed that small progress is being made. Bible. —Arcanum X depicts the Wheel of Ezekiel. Ezek. 1:15; “Now, as I beheld the living creatures, behold, one wheel upon the earth by the living creatures, with his four faces.” These faces were the composite symbols embraced in the sphinx; the Lion, the Eagle, the Man and the Bull. Masonry. —The Super Excellent Master degree of Masonry is based upon Arcanum X. Its ritual depicts the fate of Zedekiah, who did evil in the sight of the Lord, and underwent a sudden and extreme change of fortune. Magic. —In magic, Arcanum X represents the orbit of action of the blessing and cursing energy of the human soul. This orbit is elliptical, with a periodic action of its own, sure to react upon the individual; for to cause a condition in another one must create within himself the matrix of that condition. It is quite useless to fight a discordant emotion or a discordant thought sent to one by another. To fight it merely draws the attention to it and thus tunes in on its vibrations and enables them to gain a still greater potency. Thinking about either a harmony or a discord adds energy to it and gives it more force. Whether it be events, the thoughts and emanations of people who think discordantly but without malice, or the actual malicious attempt to injure one by black magic; in all cases anxious attention feeds the undesirable condition. And except to recognize that it has an existence and should be thwarted, the discord and its source should be ignored. And in addition to this judicious indifference, the attention should be given as enthusiastically as possible to something harmonious. A discordant vibration can not live in the same place as a harmonious vibration. Initiation. —As the soul progresses up the spiral ascending way of attainment, it gradually refines its organism to the end of living a richer life. On both planes, however, there is always the impact of environment; and some of the conditions contacted are sure to be discordant. If, therefore, the life-form occupied by the soul becomes sensitive without at the same time developing the power of control there may be actual danger. No matter how sensitive it becomes, so long as the soul has the power to direct the thoughts and attention, no other entity can gain control of the organism or do it injury from the inner plane. But if sensitiveness becomes greater than the power of control, other entities or discordant conditions are able to hold the attention and can cause the individual to suffer. Yet as abilities are developed only through the effort to overcome such obstacles as are shown by progressed afflictions in the birth-chart, at the state of progress here considered, astrological afflictions are viewed as opportunities to develop ability, and astrological harmonies are viewed as opportunities to use the abilities thus developed in assisting universal progression. Occult Science. —Natal astrology is the science of discerning the character from a map of the mental factors within the astral body as pictured by the birth-chart; and of determining when certain events will have a tendency to be attracted due to the stimulation of these mental factors by energies from the planets. Here also should be mentioned the doctrine of the Ten Emanations of the Sephiroth. The kabbalistical scheme of three pillars is given in most works on the kabbala, but someone a hundred or more years ago inserted a blind by placing Hod on the left and Netzach on the right, knowing that real initiates would discern that Netzach is the victory of woman. Yet this error has been copied by kabbalistical writers ever since. The correct astrological correspondences of each emanation has not been placed in writing before, but the chart on page gives the emanations in proper sequence and relations. Above all is the Limitless Light, Ain-Soph-Aur (1). Pluto, is Kether, or Crown, the point of differentiation, where soul-mates separate and where ultimately they must again rejoin. (2) Neptune is Chocmah, or Wisdom. (3) Uranus is Binah, or Intelligence. (4) Jupiter is Chesed, or Mercy. (5) Saturn is Geburah, or Justice. (6) Venus is Tippereth, or Beauty. (7) Mars is Netzach, or Victory. (8) Mercury is Hod, or Splendor. (9) Moon is Yesod, or Foundation. (10) Sun is Malkuth, or Kingdom. And below all is the region of Adonai—Shekinah. Benefic planets, of course, are on the tree of good, and malefic planets on the tree of evil, while Pluto, Venus, Moon and Sun form the Shekinah, or Tree of Life. The upper story of the diagram is Atziluth, or Emanation; the next lower is Briah, or Creation; below this is Yetzirah, or Formation; and the lowest of all is Assiah, the realm of Action. Of course, the river that waters the garden of Eden and parts into four heads is the planet Venus in the diagram and the four lines radiating from it. Each of the 10 emanations manifests in all four kingdoms, and the 12 triangles of the circumference are the 12 houses of a birth-chart; the 32 lines in the circumference representing the paths of wisdom. Four signs present the Name of every name. Four brilliant beams adorn his Crown of flame. Four rivers from his Wisdom flow. Four proofs from his Intelligence we know. Four benefactions from his Mercy come. Four times four sins avenged his Justice sum. Four rays unclouded make his Beauty known. Four times his Conquest shall in song be shown. Four times he Triumphs on the timeless plane. Foundations four his great white throne maintain. One fourfold Kingdom owns his endless sway. As from his crown there streams a fourfold ray. The planet Uranus is general significator of uncommon pursuits, of sudden changes of fortune, of inventions, discoveries, and of unconventional relations and actions; therefore the tens in their more common divinatory significance must relate, according to their suit, to one of these things. But in their higher application they reveal the influence of, and can be interpreted by, the zodiacal triplicities. The divinatory significance of the Ten of Scepters is an invention or discovery; its inner interpretation is ENTHUSIASM. The divinatory significance of the Ten of Cups is a decidedly unconventional affectional interest; its inner interpretation is EMOTION. The divinatory significance of the Ten of Coins is alternate financial loss and gain; its inner interpretation is ASPIRATION. The divinatory significance of the Ten of Swords is sudden loss of employment; its inner interpretation is PRACTICALITY. When the influence and outcome of anything is sought, the cards may be dealt on a diagram similar to the one on page , one after the other, until 10 cards are laid out according to the sequence there indicated. The cards of the Tree of Good are on the right, and indicate favorable events. The cards of the Tree of Evil are on the left, and indicate unfavorable events. The four cards in the middle are on the Tree of Life, and represent the outcome. Card 1 signifies the spiritual result, and card 10 the material result. 6 is the result concerning life and love, and 9 the result as affecting the home. The cause of the influence exerted by each card is signified by its kabalistical name. Thus if on 2, Wisdom is the cause; if on 3, Intelligence is behind it; if on 4, Mercy has an influence; if on 5, there is a desire for Justice. 6 indicates love of Beauty, 7 desire for Victory, 8 Splendor and show, 9 home conditions, and 10 physical power as distinct from spiritual aspirations signified by 1.